Everyone’s favorite graphic designer, Aaron Draplin, the big man who turns Photoshop layers into music and clean logos into lead guitar sits down with Creative Boom for and interview. DDC fans have heard this all before, but it never really gets old to hear Aaron lay down the truth. Good advice for any endeavor. If you’d like more of that then you really should buy his book Pretty Much Everything or click the link for the rest of the interview. Hey, look what urethane did for skateboarding. It created the modern era. Somehow we don’t think it’s going to do the same for snowboarding, but we can’t fault Signal Snowboards from trying. Check it out in the latest episode of Every Third Thursday: Pour It On. It’s always to good to see people doing real stuff (not that sitting in front of a monitor and copying and pasting links isn’t real). Josh Oldenburg makes surfboards by hand in San Diego, California and he seems to enjoy it. We enjoy watching him. You probably will, too. Click the arrow why don’t you. But the big motivation is just keeping my expenses down — to have that freedom,” Robinson says. “If you’re somewhere and you want to go somewhere new, but you own a house or are renting a house, you’re kind of committed to that place. And while that may have been what you wanted at that point, it may change. You may want something different. You never know what’s going to happen in the world. And that’s part of the beauty of it — you don’t know — that’s exciting. I’d rather just be ready for whatever happens. For the rest of the story, click the link. We’re always suckers for a good computer animation segment, and this one by Gabriel Thomas is right in there. Hypätä is a short story about the experience of traveling to the mountains at the height of the season, trying to catch that feeling of riding the backcountry, jumping with complete freedom and without fear when you know the pow will save your landing (and save your life) – dedicated to all the backcountry snowboarders who continue to inspire us. 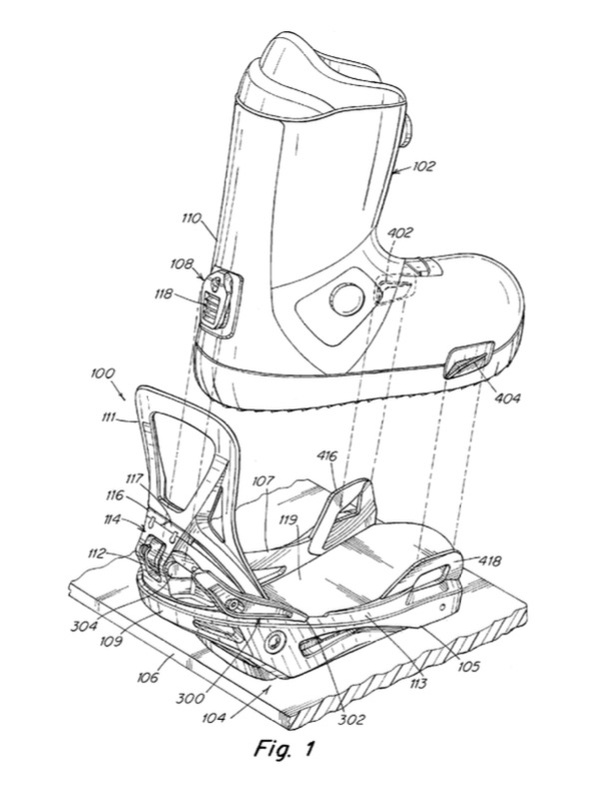 On October 6, 2015 The Burton Corporation was awarded a patent (# US 9,147,711 B1) for a “snowboard binding and boot,” according to the United States Patent and Trademark Office. The patent was filed on November 14, 2014. The newly patented system, which looks similar to the Burton SI bindings of yesteryear with the addition of an elaborate heel latching mechanism, was apparently “invented” by Raymond Robert Kavarsky, Jr., Christopher M. Doyle, and Scott T. Keller. Click the image to look at it more closely or to check out the pages and pages of official references, schematics, descriptions, click this link. We especially enjoyed the references list which includes patents held by a host of familiar names including: Fournier, Karol, Morrow, Sanders, Raines, Meiselman, Alden, Warburton, Pelchat, and even Spademan. Michael Jager (pictured right) the creative design mind behind Burton Snowboards, and the legendary design firm JDK is now turning his considerable marketing muscle toward the business of legal weed in the State of Vermont. 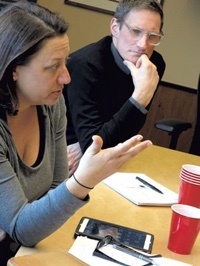 He and five other CEO’s have have created the Vermont Cannabis Collaborative, according to story on Seven Days VT. What is this collaboration intending to do? A dream team of six seasoned CEOs — almost all of them old enough to join AARP — is trying to figure out how their alternative business philosophy could be applied to commercial cannabis. Vermont lawmakers appear poised to legalize recreational use as soon as next year, in which case there will be plenty of money to be made. The RAND Corporation estimated earlier this year that Vermonters bought between $125 million and $225 million in marijuana on the black market in 2014. That’s right. They’re hoping to cash in on Vermont’s newest legalized vice. But, you know, do it the “Vermont way.” Which reminds us: pot smokers always have made us laugh. In 2005 the architecture firm (N-1) designed what just may be the ultimate snow shred house on the edge of Whistler, BC’s Khyber Ridge, according to story in HUH Magazine. Consisting of five floors, the majority of the residence has a huge glass facade and a large terrace, making the most of the stunning views, while the guesthouse on the lower level has been embedded deeper in the rock to allow for as much privacy as possible. On the mountain side of the building, which receives very little light, windows have still been added to remind the inhabitants of their close relationship with this harsh environment. Upstairs, a green roof has been added to enable to structure to better blend into the landscape. 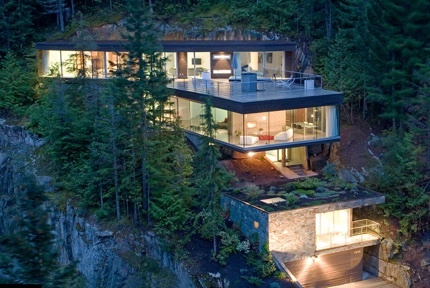 So, exactly which “professional snowboarder” had this house built ten years ago? Appears it’s Marc Morisset! (thanks, commenters!) For more photos, click the link. While we’re all waiting for something (anything, really) new from the disruptive by designers at Oakley, they’d like to distract us all from the present for a few minutes with a little ramble through their storied past. You know, when they designed amazingly cutting edge objects of sport that changed the world. The new book, cleverly called The Oakley Book, will only cost you $195 (which is probably cheaper than anything else they sell these days). The 220 page premium coffee table hard cover book is housed in a black rubber slipcase with metal ellipse Oakley logo and features 200 inspiring images throughout the brand’s history including early advertisements, world-renown athlete ambassadors and product design sketches – some of which have never before been revealed to the public. It’s a story of disruption by design, futurism mixed with heritage and vision without limit. This is the world according to Oakley. Scion has created a new touring vehicle (party van) for Riley Hawk. It’s got a load of retro flavor including a working 8-Track stereo and full shag carpet and looks to be a one-of-a-kind xB for certain, according to a story on Carbuzz.com. Kind of makes us want to blast a little Nebula just to get in the mood.